A dire warning this month by Britain’s car manufacturers attending the Paris Motor Show: losing frictionless trade with Europe and free movement of people could see them leaving Britain. Yes, it seems that leave really does mean leave. TOYOTA warned that in the event of a hard Brexit, they would be forced to halt car production in the UK, at least temporarily. The Japanese car group employs over 3,000 people at its two manufacturing plants in the UK, one at Burnaston, in Derby, and one at Deeside, in Wales. Because Toyota, like most other car makers, operates on a “just-in-time” production system, it only keeps four hours’ worth of parts on-site at Burnaston. This means the company requires constant restocking, with an average of 50 trucks delivering components from the EU each day. They all currently go through customs seamlessly, without the need for checks. That would dramatically change in the event of a no deal or hard Brexit. Their chief executive for Europe, Johan Van Zyl, said Toyota would have to temporarily close its Derbyshire plant, which employs about 600 people, and its future would be uncertain. He was not certain how long such a stoppage would last. 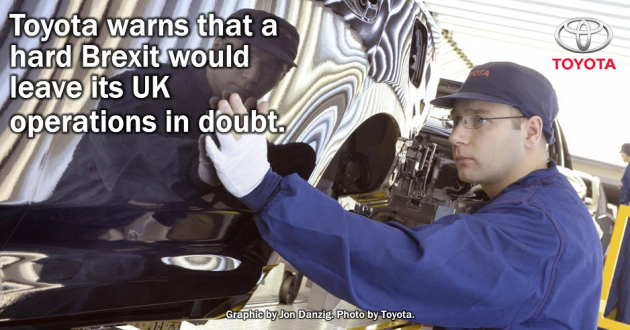 He said that if Toyota UK is unable to sell into the EU market duty free, it will affect its UK operations. He said at the Paris Motor Show, “If there would be any disruption we’d have to close our plant temporarily to make alternative arrangements. He said that Toyota wants to retain tariff-free trading after Brexit. At Toyota’s Burnaston plant in Derbyshire about 90% of the cars that come off the production line are exported to the rest of Europe. He also touched on how Australia doesn’t have an automobile industry anymore, after Toyota and other major automakers stopped producing there. Mr van Zyl added that he could not say for sure if the same cannot happen in the U.K.
BMW, which makes the iconic Mini in the UK, warned that it could shift production to the Netherlands if there is a no-deal Brexit. The car giant’s chief executive, Harald Krüger, said that he had told the prime minister, Theresa May, and EU leaders, that a hard Brexit would mean “both sides are losers”. “We will no longer fulfil trade agreements and then we are forced to build the [Mini] car in the Netherlands,” he said. Around 90% of the parts used to manufacture the Mini are imported from the EU, and need to arrive on a ‘just-in-time’ basis. 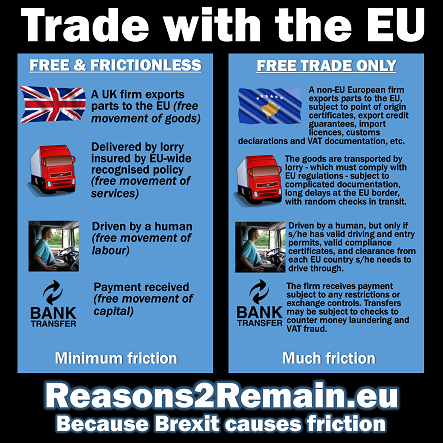 A hard Brexit, meaning the loss of frictionless access for goods between the EU and the UK, would destroy that system. Under those circumstances – which are looking increasingly possible – BMW could not sustain nor justify continuing to manufacture in the UK. JAGUAR LAND ROVER, Britain’s biggest car manufacturer, warned that it was putting on hold whether to build electric cars in the UK until the outcome of a Brexit deal was known. Only last month the manufacturer announced that more than 2,000 staff would have to go on a three-day week at its West Midlands factory because of what the management described as “headwinds”, including the threat of Brexit and uncertainty about the future of diesel cars. Mr Speth warned that tens of thousands of jobs in the UK motor industry are at risk if a no-deal Brexit goes ahead. He said that the lack of any certainty regarding Brexit meant that he didn’t know if his plants would be able to function after 29 March 2019, the scheduled date for Britain’s departure from the EU. He added that interruptions to production as a result of Brexit could cost the car manufacturer up to £60m a day. PSA GROUP, which owns Vauxhall, cautioned today that the loss of frictionless access with the EU, and the loss of free movement of people, would “necessarily impact” on their manufacturing in the UK. Their European boss, Maxime Picat, said that a no-deal or hard Brexit could threaten the sustainability of its manufacturing plants in Luton and Ellesmere Port. Said Mr Picat, “We’ve been doing all we can to develop our UK business, restore Vauxhall and Opel profitability, reinvesting in Luton and improving our sites’ competitiveness in order to help them face up to an uncertain future. HONDA has also cautioned that a no-deal Brexit would cost it tens of millions of pounds. In an interview with Radio 5 live last month, the senior vice president of Honda Europe, Ian Howells said a no-deal Brexit would lead to costly trade barriers and disrupt its supply chain. “In terms of administration, we’d probably be looking at something like sixty odd thousand additional bits of documentation we would have to provide to get product to and from Europe,” he told the Wake up to Money programme. NISSAN Earlier this year, the chief executive of Nissan, Carlos Ghosn, said the company had “absolutely no clue” how Brexit would work out and that the uncertainty left him unable to make long-term decisions about Nissan’s UK operations. UNITE, the UK’s largest union for car workers, and the UK’s largest trade union, today called on the government to “stop gambling with people’s jobs”, reported The Guardian. Tony Burke, their assistant general secretary, told the newspaper, “How loud do the alarm bells need to ring before the penny drops with Theresa May and her shambolic government that a hard Brexit or a no-deal Brexit will harm investment and damage the UK car industry? THE SOCIETY OF MOTOR MANUFACTURERS AND TRADERS also flagged up that vehicle prices are expected to soar in the event of a no-deal or hard-deal Brexit. Mike Hawes, SMMT Chief Executive said, “Barrier free access to the EU market and complete regulatory convergence have been the foundation of our success. “There is no escaping the fact that being out of the customs union and Single Market will inevitably add barriers to trade, increase red tape and cost. SMMT analysis suggests that EU tariffs on cars alone could add at least an annual £2.7 billion to imports and £1.8 billion to exports. Import tariffs alone could push up the list price of cars imported to the UK from the continent by an average of £1,500 if brands and their retail networks were unable to absorb these additional costs. The UK car industry contributes around one per cent of the UK’s output and 9.4 per cent of UK manufacturing output. It employs 169,000 people directly, and a further 814,000 in associated supply chains throughout the UK. All these jobs are potentially at risk from Brexit. THE GERMAN AUTOMOTIVE ASSOCIATION has already made clear that the German car industry puts loyalty to the European Union above trade with the United Kingdom, even if it means a loss of profits. Mr Wissmann suggested that the UK government and the EU had to be “very careful not to destroy the value chain” of the European car industry, and the options were running out as Brexit negotiation time ticked down. “If you ask me what the best solution is, it’s clear – Britain should stay in the internal market, should stay in the customs union,” he said. 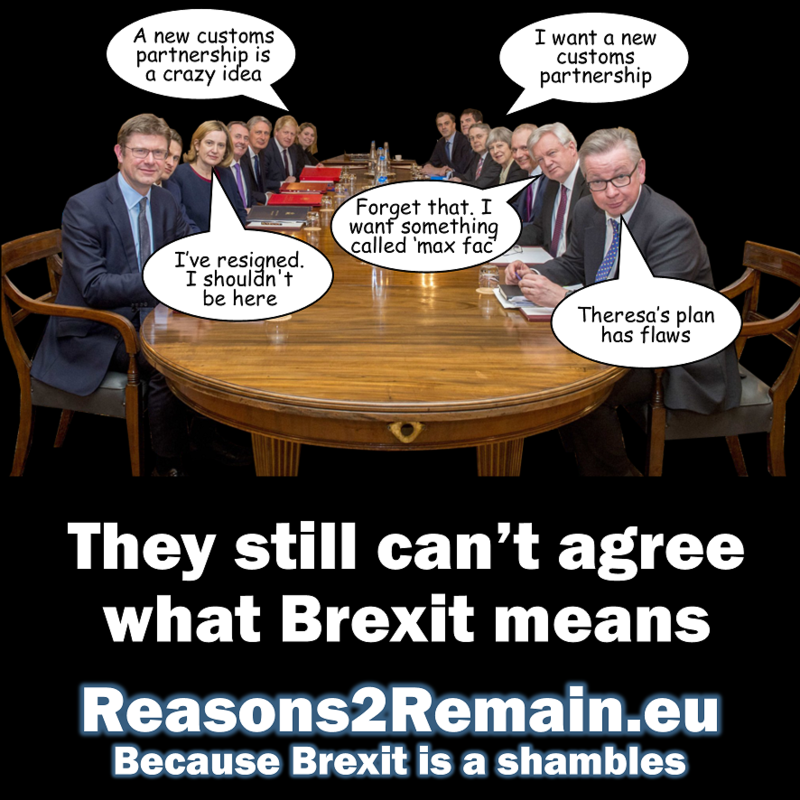 What about the idea, promoted by Brexit campaigners, that Britain should leave the EU Single Market and customs union so that it could negotiate its own trade deals? Mr Wissman responded that Germany was the world’s top exporter, including its cars, and all this was achieved through trade deals negotiated by the EU for all EU members (including the UK). Said Mr Wissman, “Do you really think that you will perform much better with your own trade agreements? I’m German. If you ask: who is the most successful exporter in the world? It is Germany. “If you ask which industry it is – it is the German auto industry. A hard Brexit now looming for Britain is likely to include the imposition of tariffs, and non-tariff barriers, if the UK becomes a “third country” under EU law in March 2019. 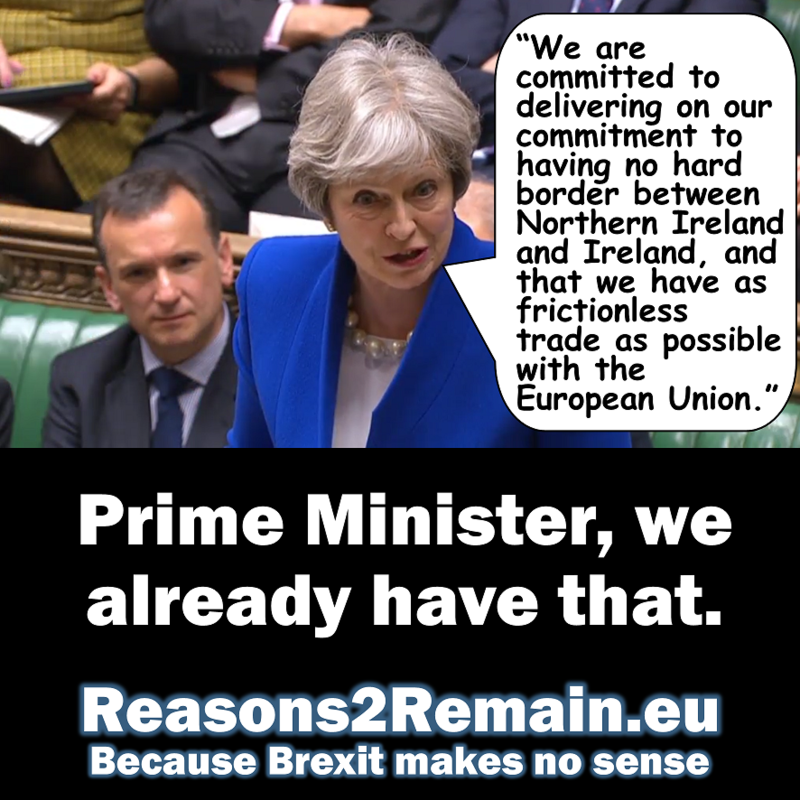 To be clear, said Mr Wissman, “the higher price would be paid by the British.” It was up to the UK Prime Minister to shift her position, he added. The question that is now resonating across the country: Is Brexit worth it? And, of course, the answer is a big loud NO. 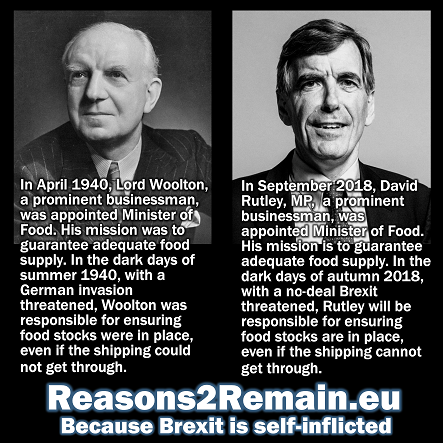 Brexit has no benefits. Not even one. When will the Conservative government and the Labour opposition wake up and put an end to the entirely self-inflicted chaos now engulfing our country? 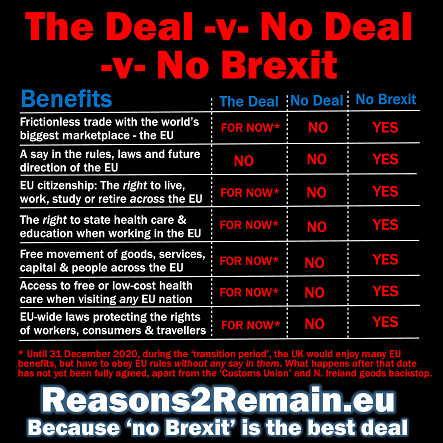 This entry was posted in Current Affairs, Democracy & Citizenship, Economics & Trade, Politics & Public Policy, The EU and tagged BMW, brexit, European Union, German Automotive Association, Honda, Jaguar Land Rover, PSA, SMMT, Society of Motor Manufacturers and Traders, Toyota, Unite union, Vauxhall. Bookmark the permalink. Previous: Can Britain stop Brexit? Yes.